To say that we had a great time in New Orleans this past weekend would be an understatement! Not only did we attend a beautiful wedding, but we also got to experience the city in multiple ways – restaurants, site seeing, nightlife, the casino, etc. And I must say that New Orleans is a beautiful city with some of the nicest people! 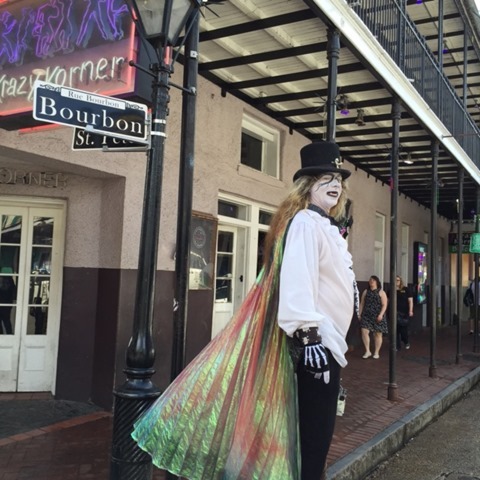 Don’t be fooled – there’s more to NOLA than Bourbon Street! We started our day super early on Friday. And by super early I mean 3 am. Vishnu really wanted to explore the city before all the wedding events started This meant we had to take a 6 am flight out of Fort Lauderdale (30 minutes from Miami). While the early start wasn’t so fun, I’m glad we planned our day that way and had the opportunity to see New Orleans. After dropping our bags off at the hotel, we took a cab to Surrey’s Cafe. Thankfully, we didn’t have to wait at all because we got there right as the restaurant opened. And the food was fantastic! 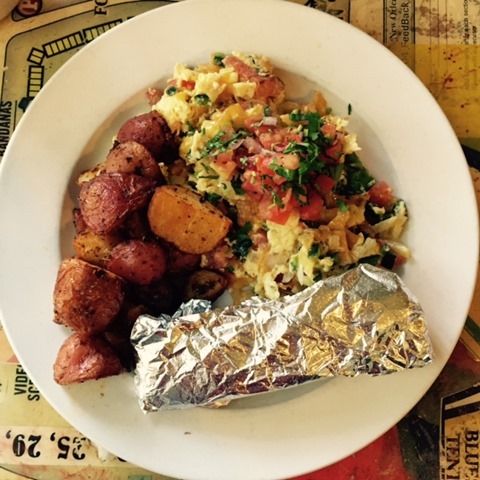 I ordered the migas with seasoned spicy potatoes – such a flavorful dish. It definitely hit the spot and surpassed my expectations. Vishnu ordered the shrimp and grits couldn’t say enough good things. 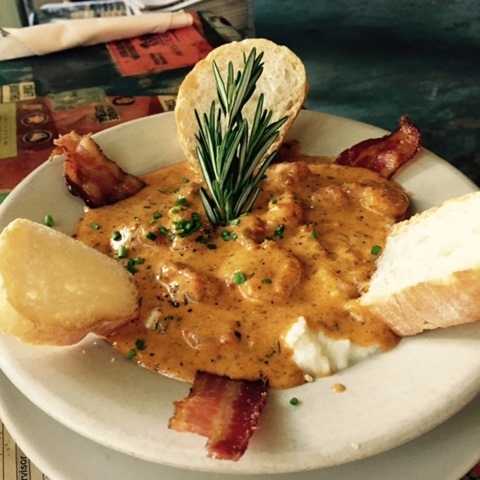 The grits were super creamy, and the gravy was slightly spicy and infused with great Cajun flavor. We were two happy campers after this meal! Next, we walked. And we walked and walked some more. We walked down Magazine Street and Saint Charles Avenue, stopping to check out the Garden District and Lafayette Cemetery. 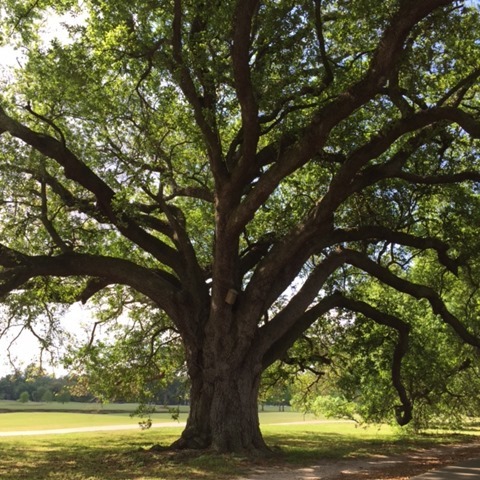 Then we made our way to Audubon Park and even got to see the Mississippi River. We were meeting friends for lunch at noon, so we hopped on the street car/trolley (I wish every city had this) and rode it all the way to Canal Street and the French Quarter. We had lunch at the Gumbo Shop, where I had vegetarian gumbo and delicious garlic mashed potatoes. The four of us also enjoyed two rounds of Cajun Bloody Mary’s. YUM! We then met up with two more friends at Cafe Du Monde for beignets and coffee. Totally worth the hour long wait! We then headed back to the hotel to get ready for the sangeet/garba. And boy did we garba (dance!). A bunch of us started when the music started and didn’t stop until the very end. Definitely got my steps in on Friday! Later that night, about 20 of us headed to Pat O’Briens on Bourbon Street. So much fun! In fact, we didn’t get back to our room until a little past 3 am. The wedding and reception were on Saturday, and both were beautiful events. Because of our late night/early morning, Vishnu and I took naps in between the events. Thank goodness because between all the dancing we did at the reception and our night at Harrah’s Casino, we didn’t go to sleep until a little past 4 am. Again, totally worth it because I won $100 playing Blackjack! Thankfully, our flight home wasn’t until 11:15 am on Sunday, so we could sleep in a bit. And then we slept some more when we got home. And because I was still tired, I went to bed at 9:30. I. Was. Exhausted. So much so in fact that my legs literally felt heavy! But we’re all rested now, and ready for our trip to Italy, which starts this THURSDAY!! So excited to hear all about your Italy travels. Hands down my favorite place on Earth! Vishnu raved about the bacon too! And you saying that makes me 10x more excited…can’t wait!! You must visit at some point! It’s a great city! omg you were actually awake 24 hours- That is awesome. I’m like you guys- If I was going somewhere for a short period of time, I’d condense as much as a I can in it! 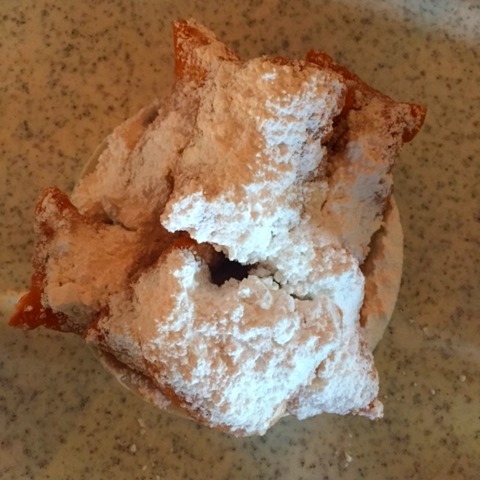 New Orleans looks amazing- and the FOOD! wow! With the time difference it was something like over 25 hours! But we never see all of our friends like this, so we decided to make the most of our time!! And the food we tried was fantastic – can’t say enough good things! When it comes to good food in the US, LA & New York always come to mind first but NOLA looks right up there too..am loving the sound of those Cajun Bloody Mary’s- genius idea! I went for brunch this Sunday and the restaurant had a Bloody Mary Special with a green chilli & pickled onion- surprisingly delicious! NYC has some amazing food! But I think every city has something to offer…sometimes you have to look in unassuming places! Ah NOLA, my home away from home 🙂 I’m always happy when someone says it’s so much more than Bourbon Street because it’s so true! Oh man, it so is! Bourbon Street was probably my least favorite place. Vishnu really really loved the park and the views of the Mississippi. I loved the food! Dude, you were awake 24 hours.. including dancing. THat’s cray!! I’ve never been to Nola but it’s the next place in the USA I want to visit. Cafe du Monde is amazing and so cheap I’ve heard. My brother just went with his family last week. Ooh a street car/trolley sounds like something I’d enjoy! 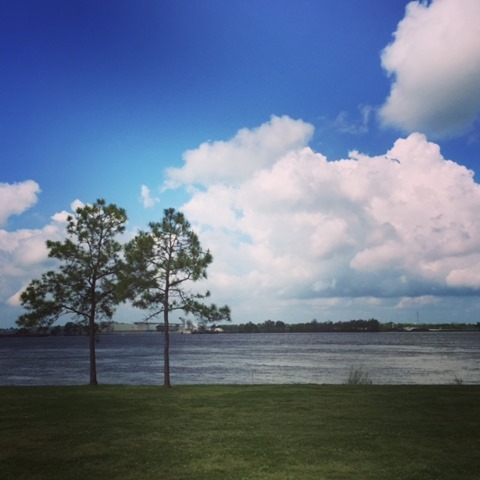 I visited New Orleans when I was a child and have been wanting to return ever since!